Welcome to the Canadian Cashmere Producers Association! Represent the cashmere goat and the people who raise them. 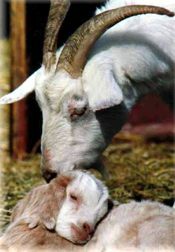 You are invited to wander through our pages to learn more about cashmere and Cashmere goats. Our breeders directory will help you find a member close to you. Please pour yourself a cup of coffee, relax, browse through our web page, and learn more about the incredible little animals who produce "The Fibre of Kings". We encourage anyone who owns or breeds Cashmere Goats in Canada to become a member and join us in representing these amazing little animals. For more information on membership, and to obtain a Membership Application, please visit our Membership page.